All parents want their children to succeed in life. I’m regularly asked, “How do I teach my children about money?” This is a great question, but we should start with another question: “What should I teach my children about money?” Once we determine the “what,” then we can focus on strategies for “how” to teach them. Here are some key things every parent should teach their children about money. Your dreams should drive your money decisions. Every great accomplishment began with a dream. Money will flow to a great idea and plan. Let your dreams influence the way you manage your money. Money will go farther if you prepare and follow a budget. A budget ensures you generate maximum impact with all of your money. Be very cautious with debt. Debt has led to the destruction of many people. Demonstrate how debt can help achieve dreams or produce income and net worth. Share how it has led to enormous stress and financial disaster. Investing allows you to capture the power of compound interest. Compound interest has allowed many people to fund their wildest dreams. It allows the combination of diligence, time, and money to yield a tremendous harvest. The importance of insurance. Insurance allows you to transfer risk thereby preventing a catastrophe from destroying everything you’ve worked to build up. Giving is living. There’s nothing more satisfying than offering a hand up to someone who can benefit greatly from such a gesture. Financial margin reduces stress. Living life “on the edge” with zero savings is for the birds. Share how a simple decision to keep some money in an emergency savings account can prevent life events (like car breakdowns, appliance failures, or emergency home repairs) from causing tremendous financial pain. A financial education is just as important as your school education. You can have more degrees than a thermometer and still be broke. Be certain to gain a financial education while receiving your professional education. Every decision is not purely a financial decision. There are times you will have to make decisions because it is “the right thing to do” even though it might not make financial sense. Be certain to allow your core values and beliefs to drive your decisions. You can either pay now and play later or you can play now and pay later. And it usually is much more painful to pay later! Anything you would add to this list? 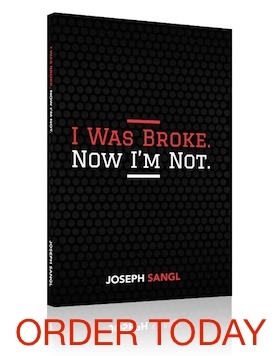 Join the conversation on the I Was Broke. Now I’m Not. Facebook Page.